Every year, air pollution prematurely kills seven million people around the world, in rich countries and poor ones. It is strongly linked to strokes, heart attacks, many kinds of cancer, premature birth and dementia, among other ailments. In Choked, Beth Gardiner travels the world to meet the scientists who have transformed our understanding of pollution's effects on the human body, and to trace the economic forces and political decisions that have allowed it to remain at life-threatening levels. But she also focuses on real-world solutions, and on inspiring stories of people fighting for a healthier future. 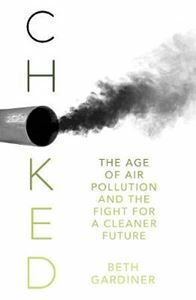 Compellingly written, and alive with the personalities of the people who study, breathe and fight bad air, Choked is a vital contribution on one of the most important - but too often ignored - issues of our time.